After a strong performance, South Africa look ahead with renewed confidence to a showdown against Wales in Cardiff next week. For Italy, this afternoon's defeat closes out a disappointing 2017 in which the Azzurri recorded just a solitary victory from eleven test matches. Italy controlled possession for large patches in the second half but simply lacked the attacking firepower to trouble the South African defence. 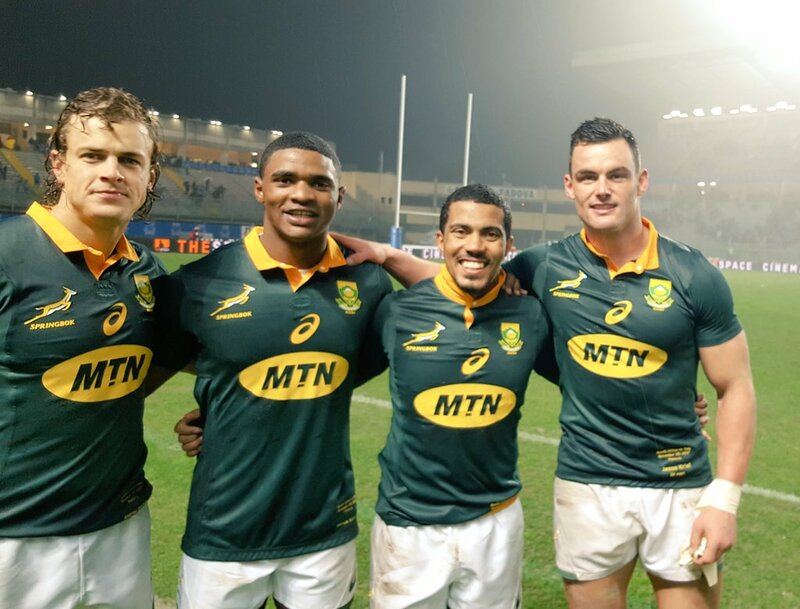 The Springboks, on the other hand, made the most of their opportunities running five tries past an undermanned Italian defence. Handre Pollard was superb for the visitors with the flyhalf deservedly taking home the man of the match award. FULL TIME - The final whistle sounds at Stadio Euganeo in Padova with South Africa recording a comprehensive 35-6 victory over Italy. Full time is up on the clock but the Italians are looking to finish a disappointing performance on a high note with one last surge inside South African territory. Jantjies opens his account with the conversion from point-blank range. After a lengthy review of the video, the all clear is given by the TMO and so the try to Mostert is awarded! TMO! WIth supreme strength, Mostert smashes through two defenders before crashing over the line under the posts - however, the referee wants to have a look at the replay and some potential foul play in the lead up. Scrum feed to South Africa just 10m out from the Iine - they head left before surging forward to within a metre of the paint. 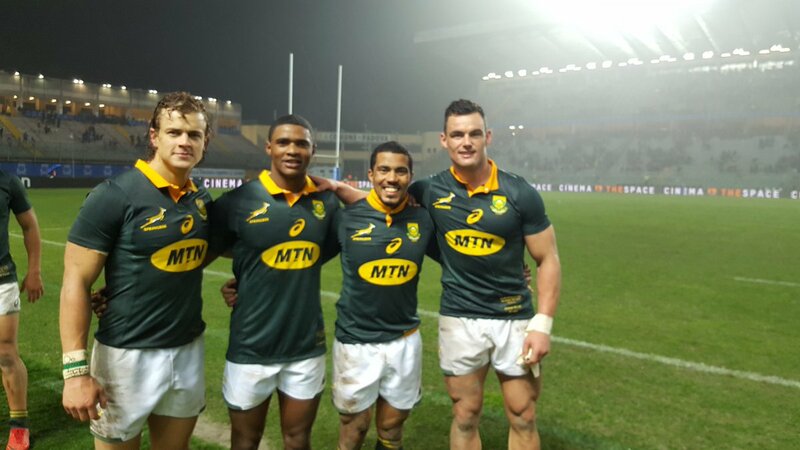 So close for the Springboks! A clever dab from Jantjies opens up the try line for Gelant however the speedster doesn't get the bounce he was after and is unable to gather cleanly. In any case, the penalty advantage was being played to the visitors. There are plenty of tired and bruised bodies out there as we enter the final ten minutes of the test match which has been played in wet and heavy conditions for the most part. 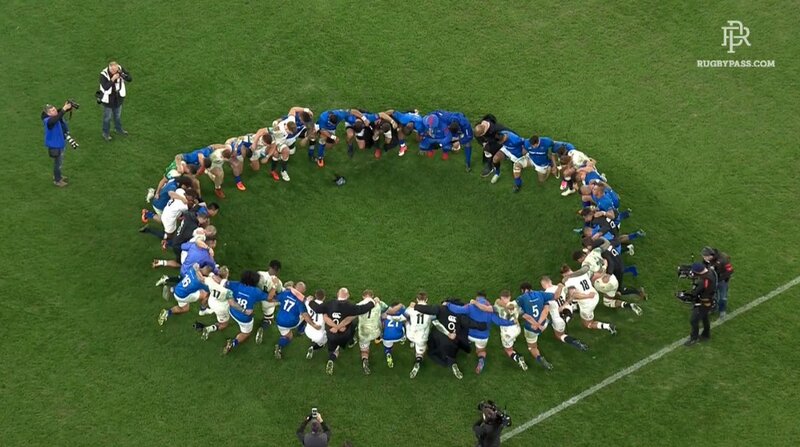 It's South Africa with the scrum feed on Italy's 22 as the visitors look to add some icing to the cake. Leyds shares the ball with Kriel out on the right hand side - with little room to work with the centre darts inboard to straighten up the attack. After spending several minutes inside their own half, the Springboks edge over half way on the back of a box kick from Paige. SUBSTITUTION SOUTH AFRICA - There's a change at fly half for the visitors with Pollard who was simply superb from the tee in difficult kicking conditions replaced by Elton Jantjies. Also coming off is Louw with Nyakane making an appearance. Italy continue to hammer away in attack but simply do not even look like making a dent in the solid South African defence. SUBSTITUTION SOUTH AFRICA - We have a break in play with Skosan, the try scorer Mbonami and Etzebeth coming from the field. In their place is Gelant, Ralepelle and Mostert. A huge let off for South Africa following a knock on from Esposito - for all of Italy's effort, they have come up empty handed. The Italians come up short however the advantage was being played - with the penalty in their back pocket, the Azzurri elect to pack down for a scrum just 5m out from the South African line. After a brilliant line break from Castello, Italy are just 5m away - they head to the right but the Springboks' defence has the numbers out wide. Italy have their best attacking opportunity of this second half with a scrum feed in the middle of the field, right on South Africa's 22m line. SUBSTITUTION SOUTH AFRICA - There's a change at scrum half for the Springboks with Cronje to make way for Rudy Paige. Italy send the ball from one end to the other looking to try and poke a hole in the defence however the Springboks' line holds firm, denying the Azzurri entry inside the 22. Parisse has run into a brick wall in the form of the Springboks' defence however, for his trouble, the Italian captain has earned the home side a much-needed penalty. SUBSTITUTION ITALY - With this test match quickly falling from their grasp, Italy look to the bench by making multiple changes - it's Giammarioli and Gori onto the field for Steyn and Violi. Pollard continues his excellent kicking form from the first half with his fourth conversion. South Africa score the first try of the second half! On the back of another well executed rolling maul, Kitshoff is held up just short of the line but he cleverly manages to spin out of the tackle before crashing over. An early penalty for South Africa with Budd penalised for a side entry - the kick from Pollard finds touch just 5m out from Italy's line. Hayward playing it safe from the back clears his kick into touch taking play up all the way up toward the half way line. SECOND HALF - Pollard kicks off for South Africa to get the second half underway. We are just moments away from kick off in the second half with both sides preparing to make their way back out onto a sodden Stadio Euganeo. HALF TIME - The first half comes to an end an a damp and grey afternoon in Padova. Italy dominated the opening minutes but were unable to fully capitalise on the scoreboard before South Africa found their rhythm with the visitors piling on three converted tries. 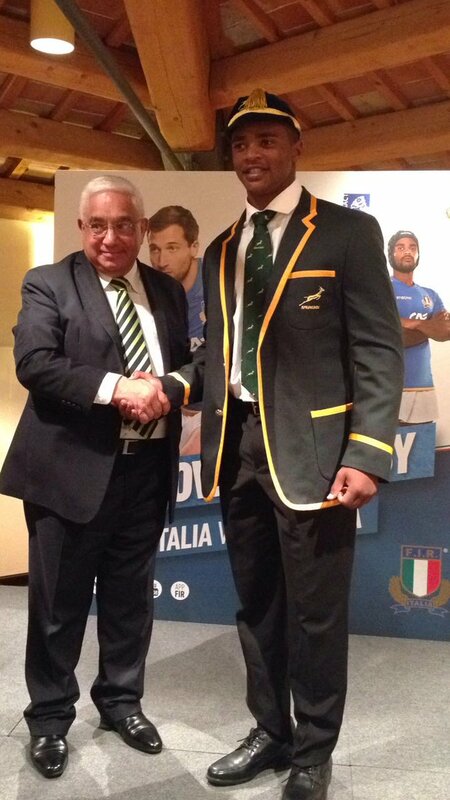 At half time it is South Africa leading Italy by 21-6. MISS! Canna sprays a relatively straightforward penalty goal attempt and a chance for Italy to close the gap right on half time has gone begging. TMO! The referee wants to have a look at a high tackle by Etzebeth on Parisse - the decision after a review of the video is that a penalty will suffice and the Springboks' skipper escapes further sanction. The pressure is right on Pollard deep inside the in-goal area but he manages to scramble a kick clear of the danger zone with a tumbling punt that has found touch beyond the 22m line. A chance here for Italy to apply some attacking pressure of their own in the lead up to half time - Bigi has the line out throw just outside South Africa's 22. Pollard is making a mockery of the difficult kicking conditions - he slots his third conversion from three attempts as South Africa's lead balloons out to a game high 15 points. After reviewing the tape, the TMO finds no reason why the try cannot be awarded and so South Africa extend their lead which has built steadily after Italy were on top early. TMO! South Africa are up in celebration with Venter claiming the try in the corner but referee Romain Poite wants to review the replay and he refers the final decision upstairs. Italy have the scrum feed but are feeling the heat at the moment - the home side have been pinned inside their own territory and are finding it difficult to break over half way. Venter offloads to Kriel as the Springboks look to mount another attacking foray inside Italy's 22 - after a slow start, South Africa are starting to find their rhythm. SUBSTITUTION SOUTH AFRICA - There's bad news for the Springboks with Mtawarira eventually succumbing to what appears to be a groin injury - he comes from the field and will be replaced by Steven Kitshoff. Pollard looks to be in excellent kicking form and he nails the conversion to extend South Africa's lead beyond a converted try. South Africa are over for their second! Smart play from the Springboks who elected to kick for touch rather than shooting for the penalty goal - from the line out, the Italian defence crumbled in the face of a massive rolling maul and it was Mbonambi who finished off the move by touching down. An injury concern for South Africa with Mtawarira on the turf receiving treatment - the prop eventually gets to his feet and looks to be ok to continue. Etzebeth runs into a wall of Italian defenders however advantage was being played and so we will come back for an earlier penalty directly in front of the posts. Canna slots the easiest of penalties and Italy close the gap to just a solitary point as we enter the second quarter of what has been an absorbing test match so far! A second consecutive penalty to Italy - this time Canna will line up the posts. South Africa are penalised for a side entry inside their own half - the Azzurri elect to turn down a shot at the posts with the resultant kick from Canna finding touch deep inside the 22. It's difficult conditions for the kickers but Pollard slots the conversion from close range and, on the back of the converted try, South Africa have edged into the lead. South Africa score the first try of the match! It's something from nothing from the visitors who barely saw the ball in the opening 10 minutes - Francois Louw is tackled just short of the line but manages to reach out and plant the ball on the paint. South Africa have been starved of possession so far in this first half but they get a chance to go on the front foot as Cronje looks to put Du Toit through a half gap in the Italian line. The kick from Canna is straight down the middle and Italy have drawn first blood in the test match after dominating the opening exchanges. The first penalty of the match has been awarded to Italy and it will be Canna to line up from right on the 22m line on a slight angle. Italy are now piling the pressure on the Springboks' defence - the Azzurri have worked their way within 10m of the South African line. Outstanding work at the breakdown from De Jager to pinch the ball at the breakdown however it comes to nought with the subsequent pass going to ground - scrum feed to Italy just 25m out from the Springboks' line. Another box kick from half way from Violi - the Italians strategy is clear in the early minutes to test South Africa under the high ball, an area in which the Springboks have struggled so far throughout the Autumn Internationals. A strong, bullocking run from Castello who initially does well to fend off the tackle from Venter before eventually being dragged to the turf just short of South Africa's 22. It's been a solid opening from Italy who recycle the ball through 10 phases, edging their way toward the Springboks' 22m line. Violi puts in a testing box kick from half way that is hauled in by Coetzee just inside the touch line. FIRST HALF - Carlo Canna kicks off for Italy and the first half is underway! The formalities are complete and the players move to their positions for kick off on a grey and overcast afternoon in Padova. We are just minutes away from kick off with both sides now making their way out onto the field. South Africa replacements: Ralepelle, Kitshoff, Nyakane, Mostert, Du Preez, Paige, Jantjies, Gelant. SOUTH AFRICA: Coetzee, Leyds, Kriel, Venter, Skosan, Pollard, Cronje, Vermeulen, Du Toit, Louw, De Jager, Etzebeth, Louw, Mbonambi, Mtawarira. Italy replacements: Ghiraldini, Zani, Pasquali, Minto, Giammarioli, Gori, Mckinley, Minozzi. ITALY: Hayward, Esposito, Boni, Castello, Bellini, Canna, Violi, Parisse, Steyn, Licata, Budd, Fuser, Ferrari, Bigi, Lovotti. Let's have a look at how the two sides will line up for this afternoon’s test match. After an excellent start to the year, South Africa’s form has dipped in recent times with the low point a heavy loss to Ireland a fortnight ago. The Springboks did bounce back last week however by edging out France in a tight encounter and they will be desperate this afternoon to string together two wins in a row. It’s largely been a year to forget for Italy – the Azzurri have won just one of ten test matches in 2017 with their last defeat coming just last week at the hands of Argentina. However, they will take plenty of confidence from the last clash between these two sides a little over twelve months ago in Florence which Italy famously won. Welcome to the live commentary from Stadio Euganeo in Padova where the 2017 Autumn Internationals continue with what is shaping as a fascinating clash between Italy and South Africa.